One of the most prominent attractions of Kangra district, Kangra Fort is located at the outskirts of Kangra town and around 22 km from Dharamshala. The fort is spread over an area of around 4 km and is guarded by high walls and ramparts. 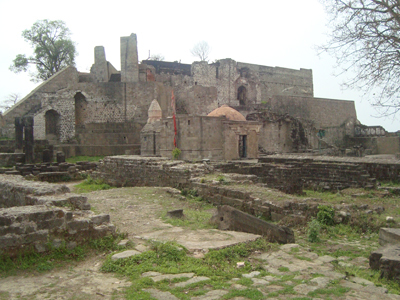 Kangra fort is located atop a hill on the base of which the river Banganga and Patal Ganga embrace each other. There are plenty of doors in this fort which are made by the rulers of several dynasties. The entrance to the fort is designed with stone carvings and known as Ranjit Singh Gate. The next entrance door to the fort is Jahangiri Darwaza followed by Ahni and Amiri Darwazas. There are three temples inside the fort called Ambika Devi Temple, the Shitlamata Temple and Lakshmi Narayan Temple. There is a temple dedicated to Jaina Tirthankaras where a stone image of Lord Adinath is installed. A staircase in between the temples of Shitlamata and Ambika Devi leads to the Sheesh Mahal where a small hall-like compartment is designed with a block of stone at the edge of which a polygonal watch tower is installed. While exploring the part of the palace opens towards Andheri Darwaza one can see the remains of a historical mosque. Also stepwell called Kapoorsagar is a significant attraction of Kangra Fort. 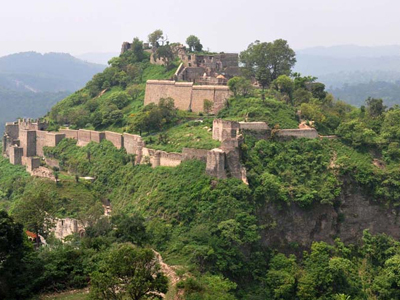 Kangra Fort is claimed to be the oldest fort in Himachal Pradesh. 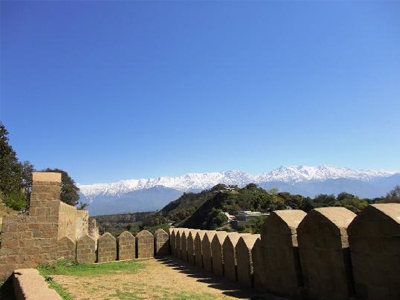 History The history of the fort dates back to 4th century BC and thus it is counted among the few prominent historical remains of Kangra. It was constructed by the Katoch Dynasty. The fort was under the possession of different dynasties starting from Mahmud of Ghazni to Ranjit Singh, the Maharaja of Punjab. 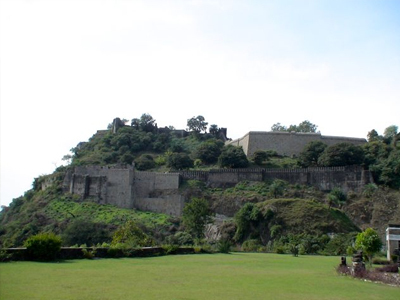 It is during the reign of Mughal Emperor Jahangir, the fort was controlled by an appointed governor to regulate the turbulent chiefs of the hill. Sikhs were the last Indian ruler who possessed this fort before handing it over to the British Government.